When I see rooms styled like this, I realize how easily I can incorporate modern accents into a traditional room to update. As you can tell this delicate mixing of modern & traditional has been on my mind lately. 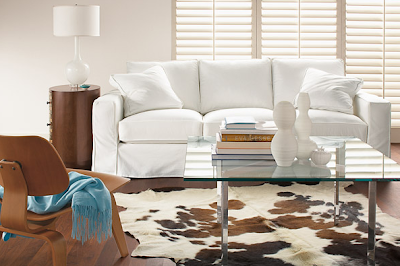 We have two light ash Eames chairs and a similar cowhide rug (ours is from DWR). I think I'd do the darker walnut? Eames chairs next time... People are always surprised at how comfortable they are.